Scary dreams are not nice but glad you have found a way of dealing with your dreams of boxes Duncan. Have a fabulous Friday. Duncan you are not looking happy in that box. What a pawsome way to end your dream. You are so smart. Duncan this Dream is GRRREAT... we loved the story.. and about the pee in the house thingy too. GOOD JOB BUDDY. BOL! A surprise ending! Thanks for pawticipating! Pee Ess - My mom has the same dream, that once she finally finds the class there is a final for which she has NOT studied (since she didn't attend the class all semester). What a great way to find yourself!! Wonderful story and I hope that your box dreams are all filled with wonderful things like you or those golden bones! Oh Duncan, what a FABulous endin'!!! I was on the edge of my puter chair the whole way through!! I thinks I even spilled my margarita when I saw YOU were inside! I thinks that would be a FABulous surprise!! 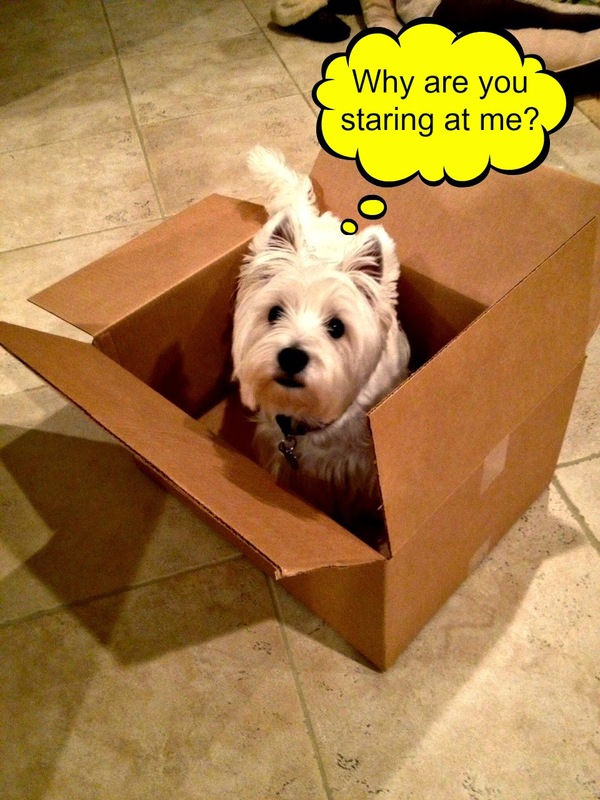 I fink I'd be more scared if I found myself in a box, BOL! How great to find yourself Duncan! Crikey Duncan ..... you found YOURSELF!!!!! That's like magic, mate, aye????? That would be a scary dream. All we want in the box is treats! I think you found the wonderfullest thing of all!